Millennials are considered to be the most health-conscious generation ever. We are conscious about what we eat, what we drink and we take care to exercise regularly to maintain our health. But are we really conscious about our home and the health hazards that are lurking in it? Most of us spend at least half of our day inside our home. That is why a healthy home is indispensable for a healthy body. So, here are a few tips to help you maintain a healthy home. Studies have found that indoor air could be five times more polluted than air outside. Hence, proper ventilation is necessary to ensure that the pollutants and toxins inside the home is properly exhausted. So, what is proper ventilation? Simply keeping a window open will not help with freshening up the air inside the home. Rather, you have to keep as many windows as possible or at least 2 windows in two ends of your home open so as to facilitate cross-ventilation. Installing a chimney hood in kitchen is also vital for ensuring the smoke from cooking doesn’t linger inside your home. Moreover, fry food in the right temperature to reduce burning and excess smoke. 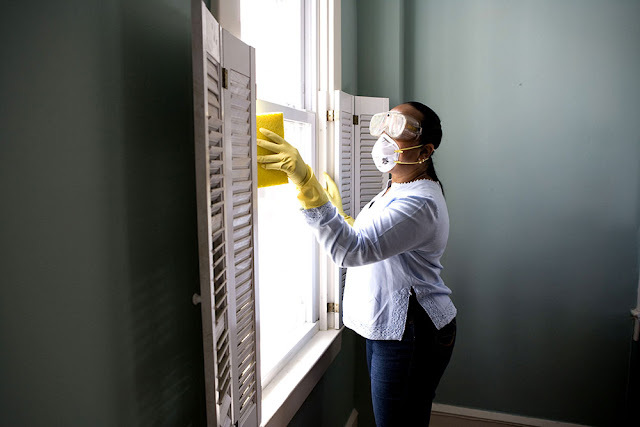 Damp conditions lead to mold and mildew formation inside home, which can irritate your eyes, nose, throat and cause stuffiness, sneezing and wheezing in allergy and asthma sufferers. So, how can we keep the home dry? First of all, check the roof and ceiling for leaks. Even though water might not be dripping down in cases of leaks, the ceiling could be damp resulting in peeling of paint and even fungus growth. You could also install exhaust fan inside bathrooms and dry clothes outside to prevent excessive moisture built-up inside your home. Check the label of any of the cleaning liquid you use at home and you can see warning that it is toxic and has to be kept out of reach of children. The fumes from these cleaning liquids can cause undesired side effects on your health in the long-term. Hence, resorting to natural cleaners, though expensive, is a safer and healthier option in the long run. Vinegar, baking soda, essential oils, liquid castile soap are also some of the alternatives to regular cleaners that you could use. Just glance through the newspaper and you are likely to read about at least one fatal incident as a result of negligence at home. Maintaining electrical cords intact, keeping away iron box after use, labelling chemicals and keeping kettles and dangerous goods out of reach of children is pretty important for a safe home. Also, avoid storing kerosene and other chemical liquids in soft drink bottles (especially sprite and 7 up bottles) as small children might open and drink it mistaking it for soft drinks. This is something that goes without saying. Regular dusting, cleaning of exhaust fans, heaters, door mats using non-toxic cleaning supplies is vital to avoid allergies and exposure to harmful pollutants. Also, take care to wash bed linen on a weekly basis and bath linen every 3-4 days in order to maintain hygiene as well as eliminate dust mites which is one of the leading cause of indoor pollution. If you see a cockroach or a rodent inside your home, take action immediately. Fill cracks, seal trash covers and use household pesticides immediately and eliminate the pests. If it doesn’t work, hire a pest control professional immediately. If you wait for long, the pest infestation will simply rise beyond control. So, which of these tips do you find useful? If you have any more tips and suggestions, please share it for our readers in the comments section.